Vi-Vi was an Italian motorcycle company based in Turin that produced mopeds. Founded in the second half of the 1950s, a Section motorcycle of Viberti, famous manufacturer of body composition for trucks and Buses, and had a brief experience in providing motorcycle frames that where sheet printed for Maserati mopeds, for female users. In order to enter the then booming market for "two wheels", the Viberti shook a pact for supply of engines and the co-design with Victoria, one of the oldest German motorcycle company, the brand Vi-Vi was indeed an abbreviation of the two brands. This is the December 1956 when the Hall of Bicycle and Motorcycle by Milan is presented the "Vi-Vi Tourism 50", preceded by a press campaign that impressive as the proposed " the utility of utility. The list price was so low compared to competition and also benefited from comfortable conditions installments, to burst from an unusual protest by the Italian motorcycling that case, a loud voice, demanded the expulsion from the hall of the "Vi-Vi." for unfair competition. Competitors argued that it was not possible to produce a motorcycle that made at prices so low and that the operation was orchestrated by the Fiat (who at that time controlled the "Viberti") in order to damage them. 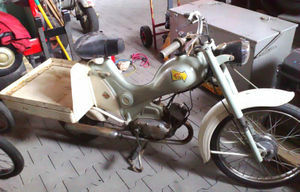 Production of the first decade consisted of mopeds utilitarian frame printed sheet including the shell, the traditional style and technique, but particularly cared for the bodywork and assembly. The range, single-cylinder engines equipped with Two-stroke, the models included "Touring", "Gran Turismo", "Sport", "Scooter" and "van". However, despite the low price, good construction quality and favorable conditions of purchase, should be recorded that the "living" failed to achieve extraordinary sales results, and men than ever, positions of leadership in the market for mopeds. This is probably because of its too "classical" models and the lack of drivers "Victoria" in the national territory. In the second half of the '60s, following the end of the supply of engines from the "Victoria", the company was sold and moved to Pontevico (BS). He continued to produce motorcycles with engines Minarelli over a cycle, under the name of Vi-Vi SaS.